Having amassed in excess of 140,000 Instagram followers, been the subject of numerous articles and run out in front of thousands of fanatical fans, Karolina Bojar has already achieved what many can only dream of, a fact made all the more impressive given her young age. Named earlier this year by the best-selling British daily The Sun as being ‘The World’s Sexiest Referee’, the 21-year-old’s blooming career as a football ref has found her standing in the spotlight on plenty of occasions with her striking looks garnering no shortage of attention from the foreign tabloid press. A law student at Jagiellonian University in Kraków, her full-time studies at one of Europe’s most revered seats of learning have been combined with a burgeoning second life as a football official – yet as incredible as it may sound, Karolina’s unlikely trajectory has not been entirely unexpected. Eventually, just watching was no longer enough. 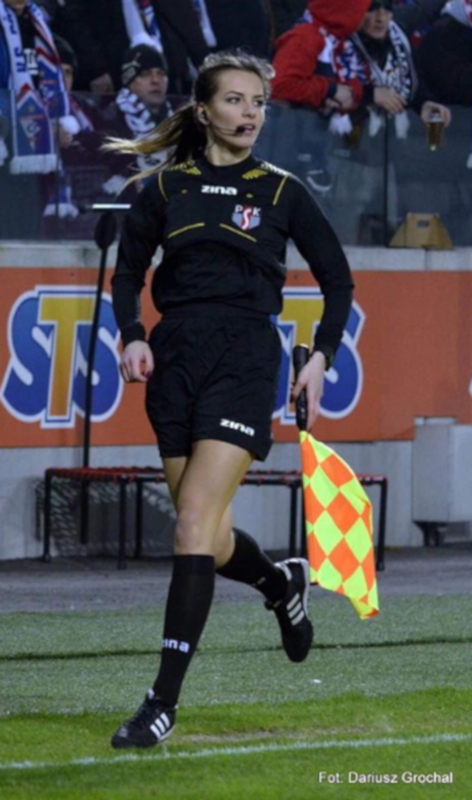 Officiating her first game as a 17-year-old, Karolina immersed herself in the inscrutable world of football refereeing. “The first matches were difficult,” she admits, “and I immediately learned that just knowing the rules inside out wasn’t nearly enough. As well as having the knowledge acquired on refereeing courses, you need that ability to make split-second decisions, stay focused and keep control of all the many things that are happening on the pitch. As her professional stock rises, so too have opportunities to prove herself among the best. A highlight, she says, came running the line for a friendly match between Hajduk Split and Górnik Zabrze. Certainly, this is not some pastime that stands to be discarded. Though harbouring future plans to enter a job related to sports law, refereeing is not simply a stop-gap hobby, rather an almost spiritual extension to her natural being.